The veterinarians of Palm Beach Equine Clinic (PBEC) have always enjoyed contributing to supporting the local community in Wellington, FL. As a leader in equine veterinary medicine, PBEC makes it a priority to share knowledge and guide the aspiring youth. Currently, through Wellington High School’s (WHS) Equine Pre-Vet Program, PBEC has a hands-on program for students to enrich the minds and further the careers of the industry’s promising young professionals. The Equine Pre-Vet Program at WHS provides students with an opportunity to pursue a rigorous, accelerated science program to prepare them for veterinary medicine and/or animal sciences at the college level. Equine Pre-Vet students are required to complete twenty hours of community service in an animal-based area during each year of high school. As a senior in high school, students are also required to intern with an animal health care facility, complete research assignments in animal health care/medicine and prepare veterinary case studies. WHS seniors that choose to pursue the Equine Pre-Vet Program have a wealth of knowledge at their fingertips with one of the world’s most advanced equine medical centers just down the road. Palm Beach Equine Clinic is home to 28 world-class veterinarians who all know the process of becoming a top veterinarian within the industry. Through the program at WHS and the generosity of the veterinarians at PBEC, students in the Equine Pre-Vet Program have the unique opportunity to learn all about the profession from the very best. Seniors in the program are given the chance to shadow veterinarians as they work at the clinic, as well as out on ambulatory calls at the farms. The program requires that each student obtain a certain number of externship hours, but PBEC allows the students to help and observe for as many hours as desired. Many students show a high level of interest and become highly involved at the clinic. PBEC tries to accommodate each student for their participation at every level. A program is also offered for junior students at WHS who are thinking about joining the Equine Pre-Vet Program when they become seniors. Junior students are invited to the clinic to learn about various veterinary medicines and tour the facility in small groups. PBEC sets up multiple stations for them to learn about things including blood work, physical exams, reproduction, and business management. Palm Beach Equine Clinic’s Dr. Janet Greenfield-Davis is very involved with the program and enjoys teaching students of all ages. She has been involved in the local school system’s career day for younger children at the elementary level, and also mentors the senior students who have already chosen the veterinary path involved in the externship program. 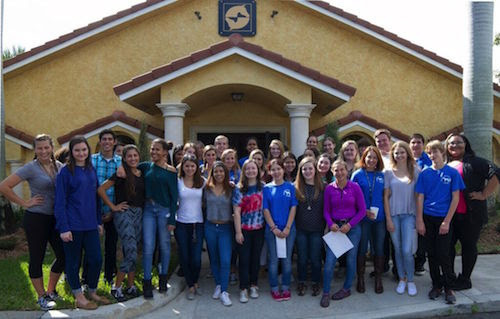 Palm Beach Equine Clinic is proud to team with Wellington High School in this great program to help further the education of Wellington’s promising young veterinarians. For more information on Palm Beach Equine Clinic, please visit www.equineclinic.com.